So, it looks like George Soros just invested $US500 million with Bill Gross. 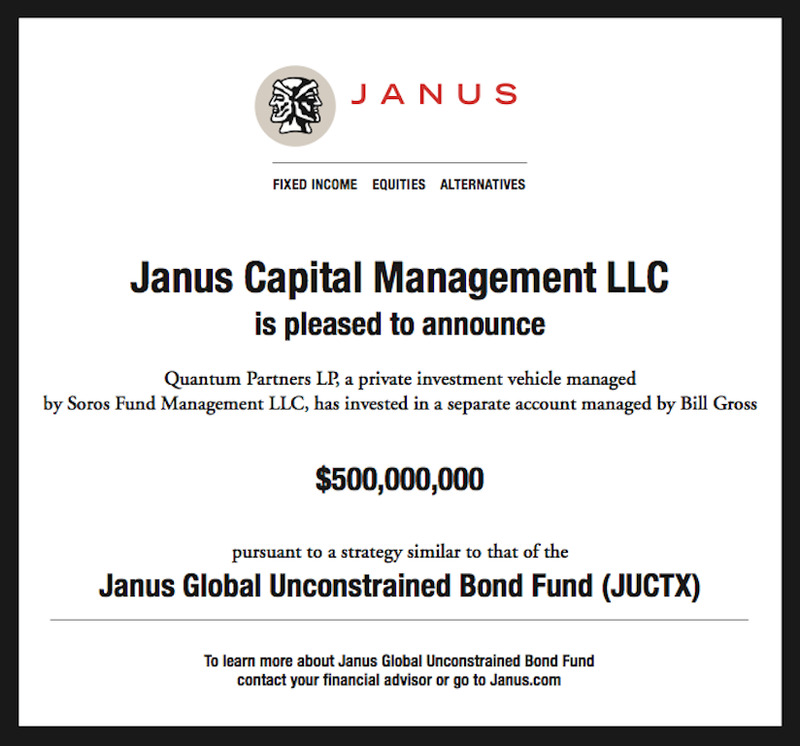 In an announcement on its website, Janus announced that Quantum Partners, a private investment vehicle managed by Soros Fund Management, will invest $US500 million in an account to be managed by Bill Gross. Soros Fund Management is the hedge fund founded by legendary investor George Soros in 1969; Soros still serves as chairman of the firm. The account will be managed in a strategy similar to the Unconstrained Fund, which is what Bill Gross manages at Janus, but will not be part of that fund. According to data from Janus, as of October 31, the Unconstrained Bond Fund had $US442 million in assets under management. Bill Gross joined Janus in late September after leaving PIMCO, the firm he founded in 1971, where Gross managed that firm’s flagship Total Return Fund, which had over $US200 billion in assets under management. 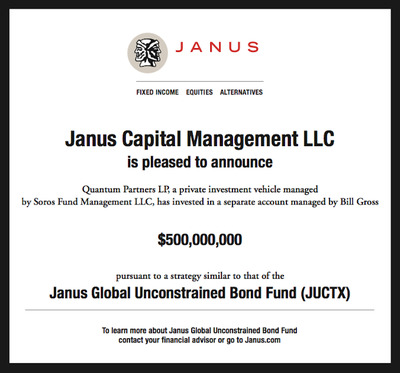 When Gross joined Janus, the Unconstrained Fund had just $US13 million in AUM. Recently, Gross was in the news after Bloomberg’s Barry Ritholtz reported that Gross was paid a bonus of $US290 million 2013, though PIMCO told Business Insider that figure wasn’t accurate. Here’s the release from Janus.